Alisa Zotimova was interviewed by russian financial media ‘Finansovaya Gazeta’. The main topic was Brexit and its influence on investors who are interested in real estate in Great Britain. 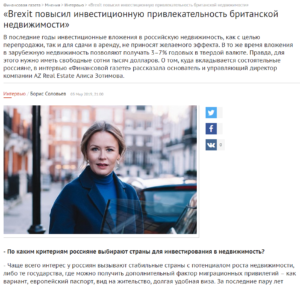 Alisa Zotimova thinks: ‘Brexit has made British real estate more attractive for investors’.